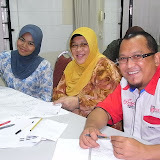 I conducted an Official Letter Writing Course for UPM on 20/7/2011. I thought there would be only 20 pax but I was surprised when 50 participants turned up. it was like a mini concert. 5 participants were former participants from who attended The English Express programs. Puan Zuyati and Ari were the secretariats while Puan Rozi made the arrangements for the program.